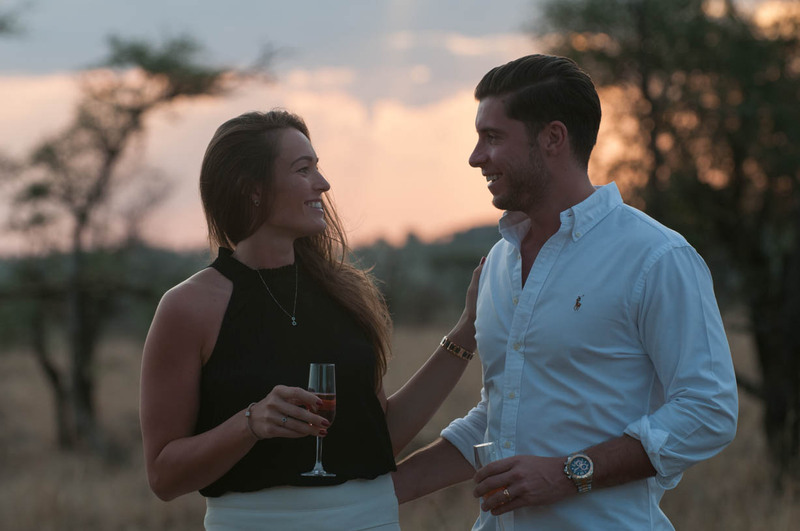 In addition to all day safaris, hot air balloon rides, private bush dinners and champagne breakfasts (to name, genuinely, just a few! ), as a couple you can also do an amazing vow renewal experience. It’s of course not aimed at newly-wed couples, but a couple who are celebrating a special anniversary or want something unique with a romantic spin on the event. Even though J and I had only just said our vows, or rather cried through them (! ), they asked if it was something I could share with you guys and given how incredible the experience is and the amount of thought they put into it, I am glad I didn’t hesitate. So for those who are looking for something different and really unique to celebrate your marriage and remember the day – read on! 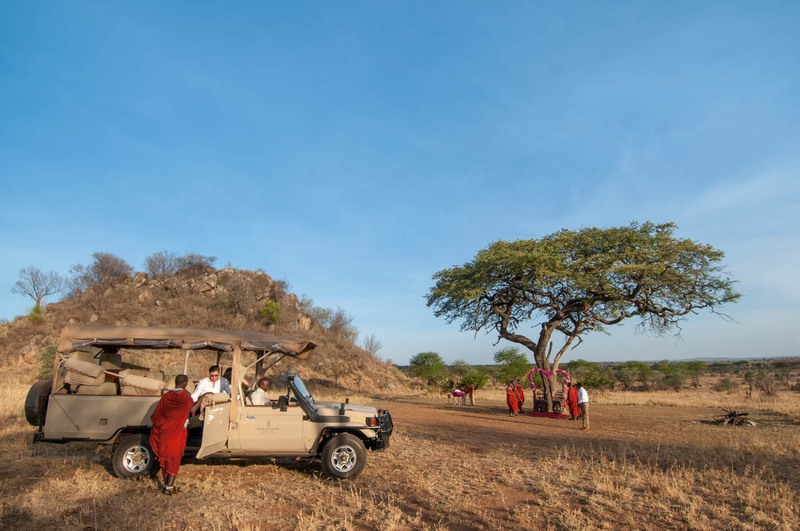 The site is just a few minutes drive from the safari lodge where you’ll be greeted by the local Maasai tribe. 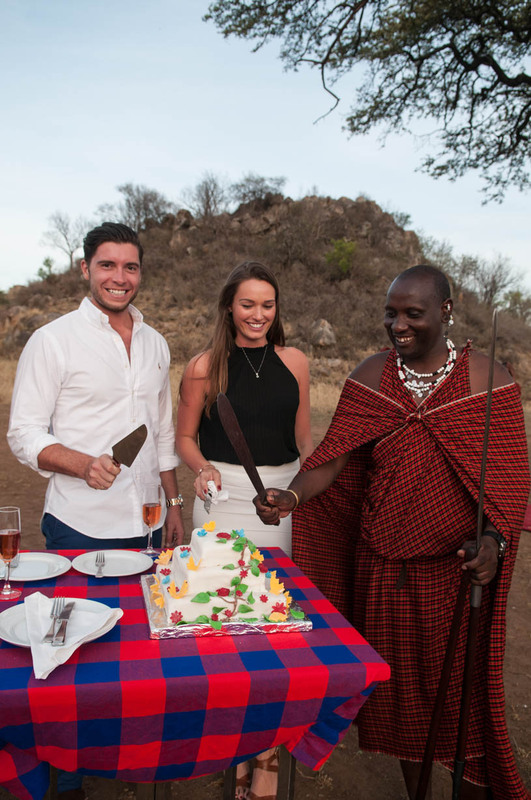 The vow renewal ceremony is carried out by a lodge host before sharing celebratory champagne in this idyllic bush setting! 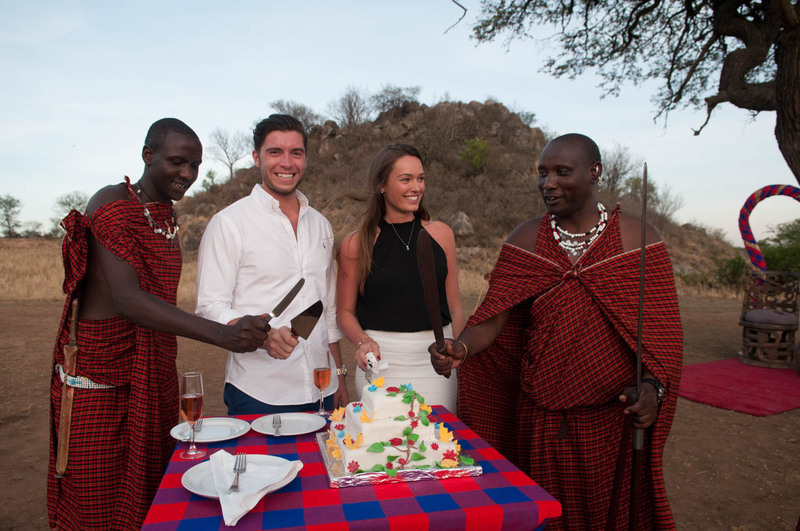 Perfect timing for sunset..
No vows are to be said without yummy wedding cake! The team at the Four Seasons asked us what type of cake we wanted created along with every other detail. Nothing is too much trouble or impossible to do, which makes it a really special and intimate occasion for those celebrating. 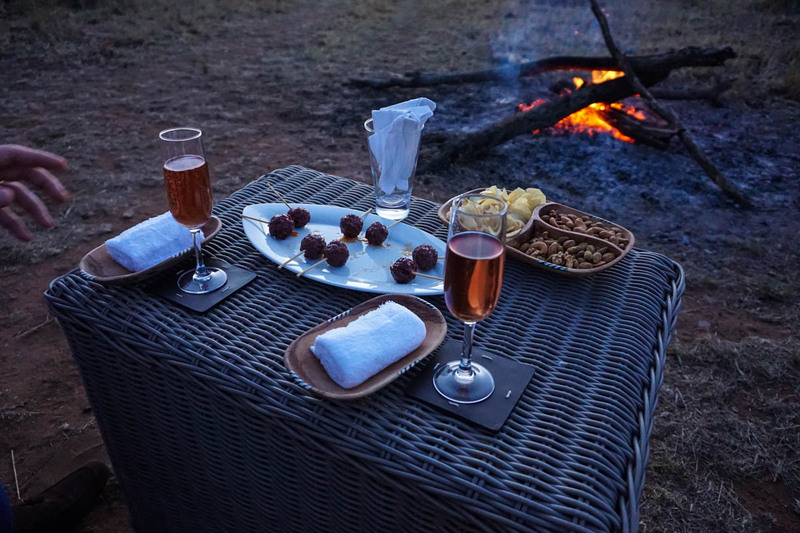 After some champagne and the cake was cut, we moved over to the camp fire which had been set up perfectly to watch the sun go down. 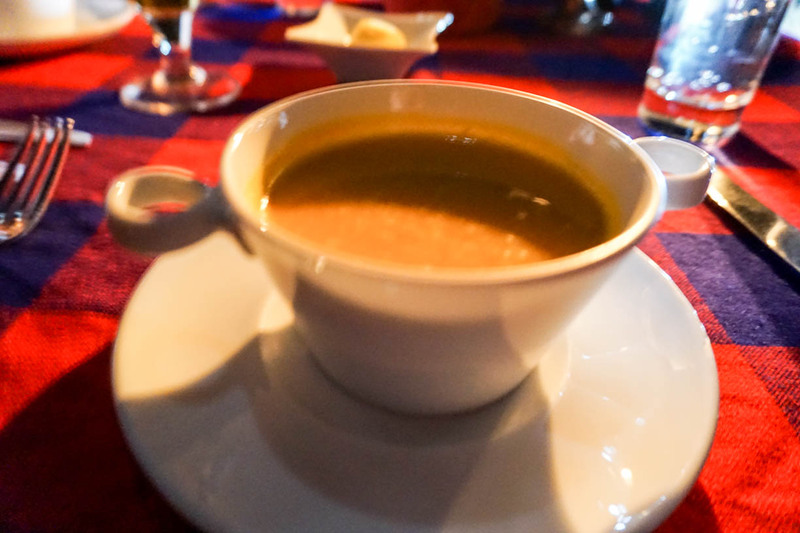 Whether your preference is champagne, red, white, beers or spirits – everything is there ready for you, along with delicious appetisers to start the dining experience! 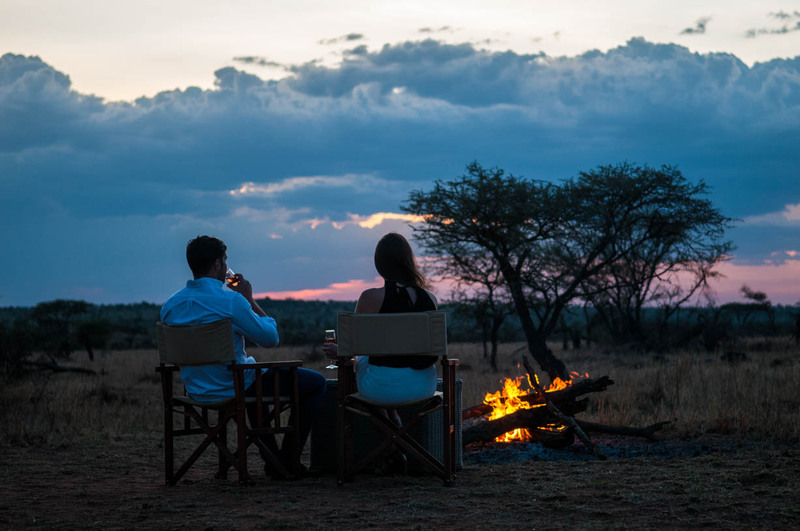 You really are completely immersed in the Serengeti bush, and speaking from experience having had a few romantic dinners for two set up in remote location – nothing can quite compare. 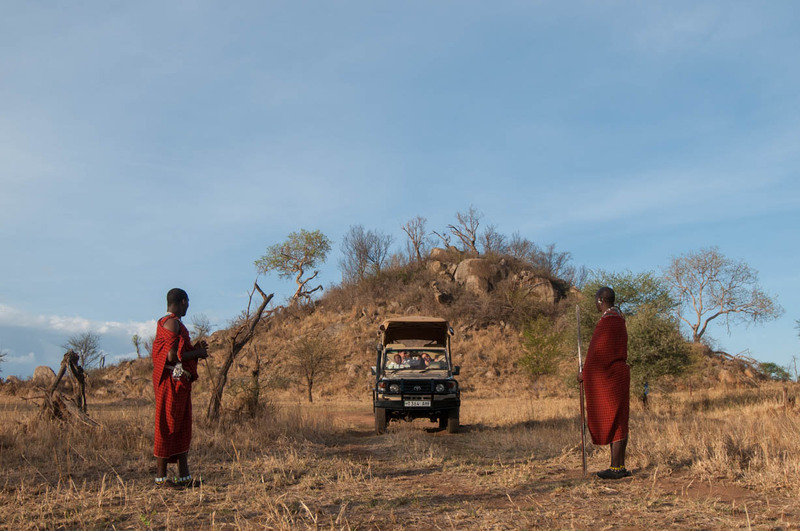 There’s even security on hand incase a problem arises with the wildlife, which only adds to the surrealness of where you are and what the experience is. 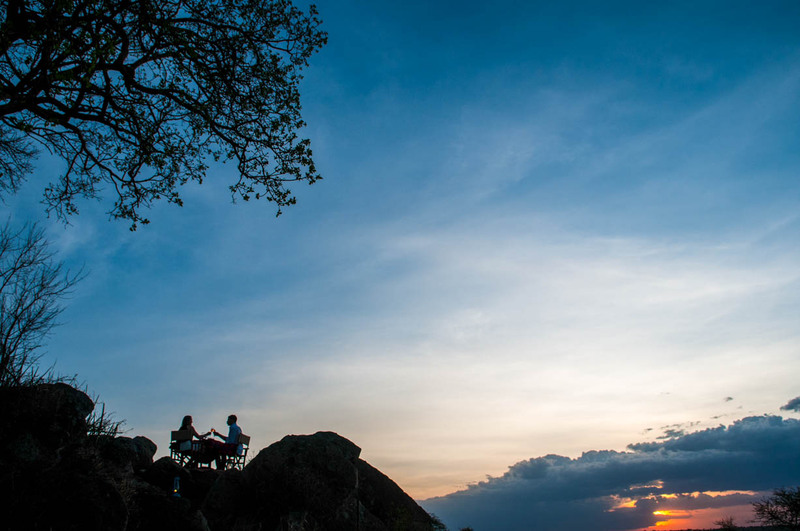 Dinner is set atop a small mountain of rocks, which can only be described as picture perfect. It’s a little bit of a workout for the team at FS in order to get up, but you wouldn’t know with the smiles and friendly welcome you’re greeted with. We may not have been renewing our vows on this particular night but I can’t fault the romantic, and honestly, very dreamlike setting! 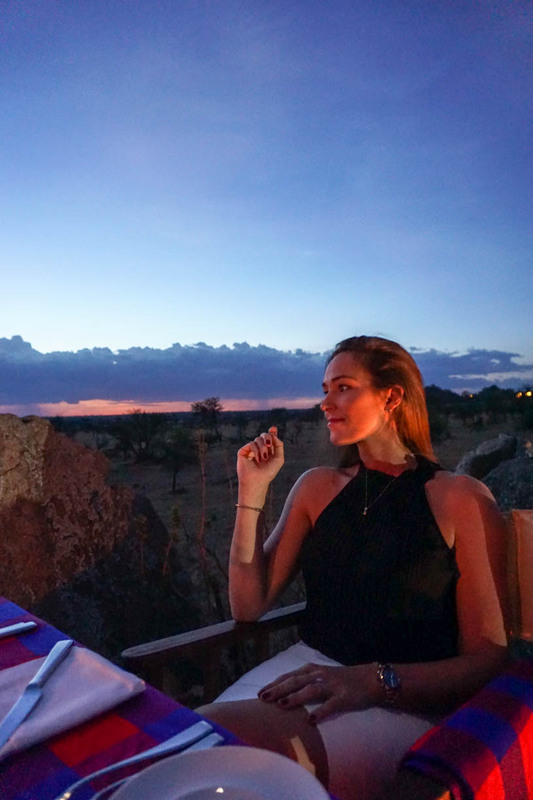 Dinner is an exquisite four course meal overlooking the savannah plains. Starting with freshly baked bread and sweet pumpkin soup, followed by a more-ish goats cheese and beetroot salad. 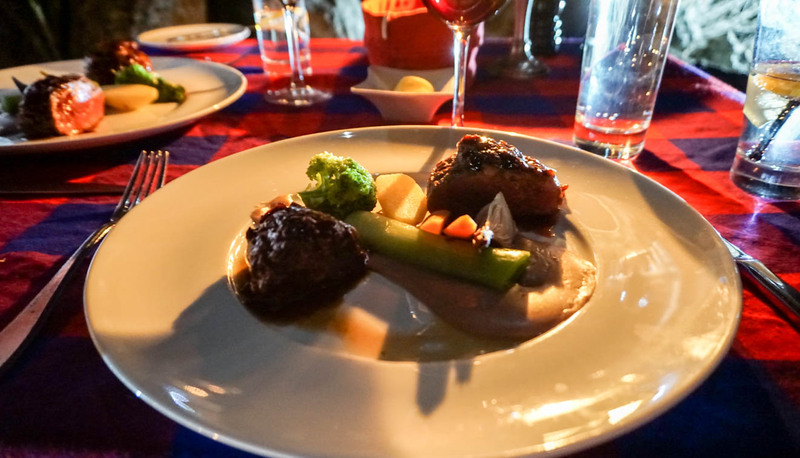 Main course was exceptional; you don’t necessarily expect food cooked out in the open to be of the same quality of fine-dining restaurants but the steak was one of the best I’ve had – the food is nothing short of brilliant. 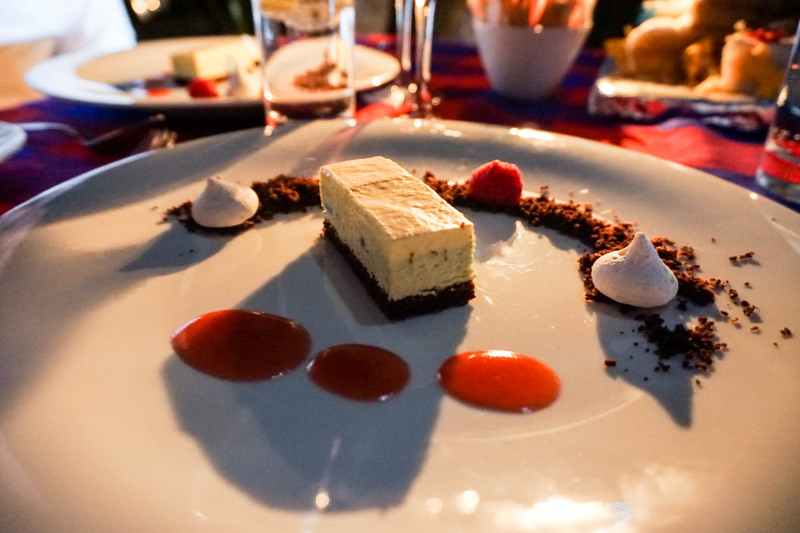 To finish – cheesecake sprinkled with meringue and chocolate ‘soil’ and of course, the wedding cake and a selection of after dinner drinks. I’m sure the menus can be adapted to all taste preferences and they also mentioned people have celebrated in larger groups before with a bigger table set up just where the camp fire was. When Jack and I reach a special anniversary, this is exactly the type of thing I would love to do; it’s totally different and allows you to celebrate in such a unique environment. Thank you for letting us experience it @FS and if anyone has any thoughts or questions about the Vow Renewal Ceremony then please do comment below! 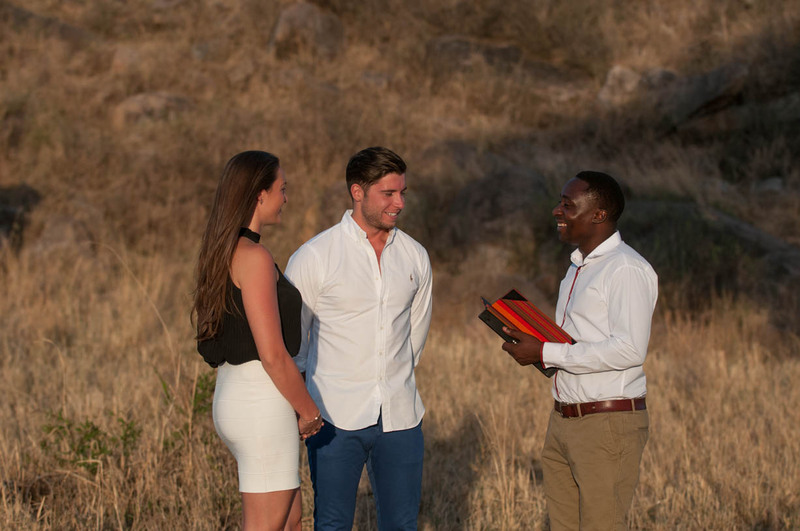 To find out more about FS Vow Renewal experience, you can have a look at their website here. By Carly Neave, November 13, 2016 Hello and welcome! I'm Carly, originally from London but currently enjoying a little adventure in Dubai. 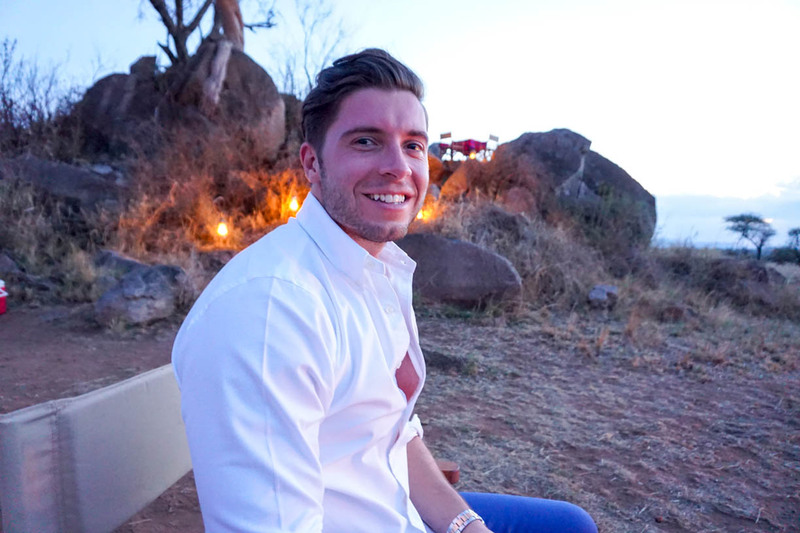 A travel and wellness blogger exploring the world one step at a time. 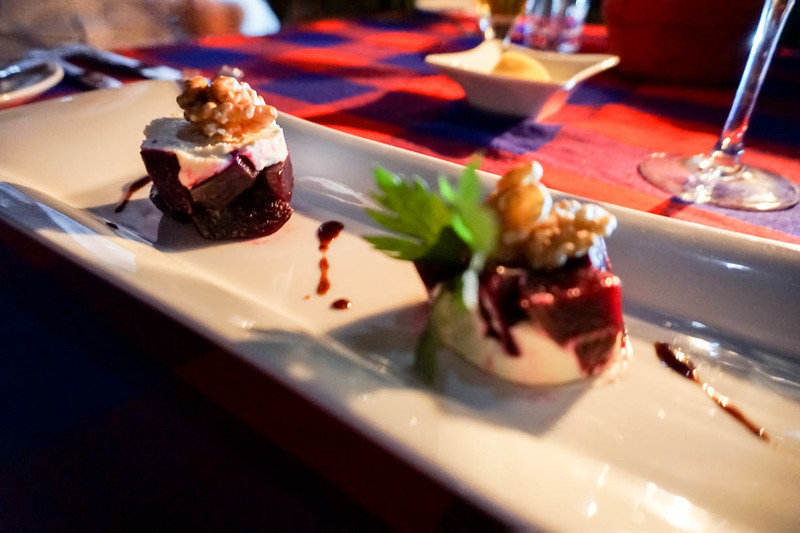 Think fabulous food at undiscovered gems, unique destinations, skin care obsessions and so much more. This is my life, I hope you enjoy the ride!